Monthly Recurring Revenue This is your monthly recurring revenue minus your monthly fees. Revenue Growth Rate This shows how your revenue is progressing. 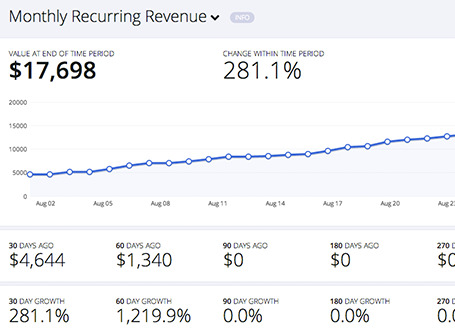 MRR Churn This shows how much money you lose/gain in revenue each month from cancellations, downgrades, and upgrades. Lifetime Value This shows how much money you earn on average with each customer until cancellation. Average Revenue Per User This is your average monthly revenue for one customer. ARPU Growth Rate This shows how your average revenue per user is progressing. User Churn This shows how many of your customers cancel each month. Active Customers This is the total number of paying customers subscribed to your service. Annual Run Rate This is 12x your monthly recurring revenue. New Customers This is how many new customers subscribed to your service. Customer Growth Rate This shows how your number of customers is progressing. Downgrades This is how many customers switched to a lower plan. Upgrades This is how many customers switched to a higher plan. Cancellations This is how many customers you lost. Refunds Refunds for any charge. Total Fees These are your monthly Braintree fees. Get a real-time view into the key metrics that drive your growth. 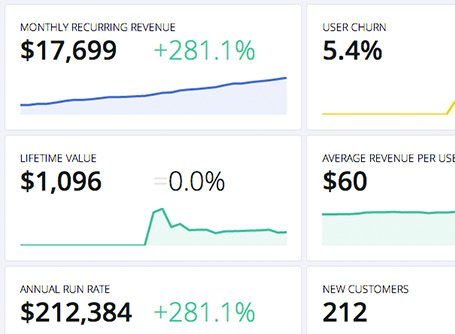 See at a glance how your SaaS business is doing and react at the right time. See how your business is progressing. Easily compare different time periods to see how changes in your strategy are taking effect. Risk free, 30-day money back guarantee! We are adding more and more features currently, and we are open to your suggestions. Please contact us and let us know how Mainmetrics can be even more useful for you. Is any code/development required to get started? There are absolutely no coding skills required. After you have signed up, just connect with your Braintree account with one click. I have a non-SaaS business. Will it work? We currently only support subscription-based services. If your business relies on one-time payments and you would like to use Mainmetrics, please contact us. Of course, you can switch plans based on your needs. Please contact us within the first 30 days if you are not satisfied with Mainmetrics. We'll refund your money. Please understand that we cannot issue refunds after your first 30 days. It is safe. All transmissions and communication are encrypted with the latest encryption algorithms. You can! Contact us so that we can make you an offer. What are the exact formulas of the metrics? Visit our help page to find detailed descriptions.